Answer us this: What's got Roger Clemens dropping F-bombs in the above photo? 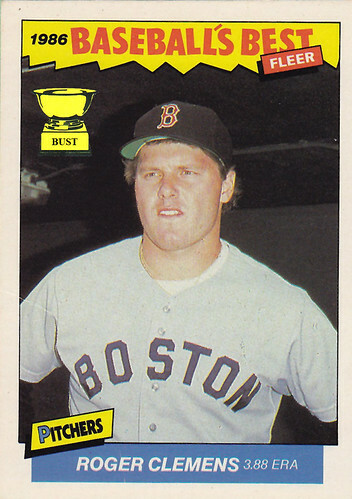 A) Fleer got his ERA wrong (2.48 in '86, 3.29 in '85). B) The photog just asked him to pronounce Bucky Dent's name. C) He's just suggesting a way for Dave Winfield to fill his leisure time. D) Just got his first look at Mindy McCready.